United travelled to Spurs to keep their unbeaten run going and they did. The Spurs defence was intact but Lloris and De Gea were incredible to restrict either side from getting a goal at White Hart Lane. It was a full house at White Hart Lane and the fans where atmospheric from the battle of the two great teams who have had tricky start to the season. 43 hours since the last premier league games. Mata's took a free kick from the left whipped in high, Rooneys' head met the ball but Hugo Lloris punched the ball away. United's corner is cleared. Spurs knew they had a game on their hands. Eriksen whipped the ball intothe box the ball was easily cleared by the visitors. United started well when Spurs struggled to get hold of the ball early on. So close, Falcao should've scored but his shot was adrift of the right hand post. Van Persie took a curling and dipping free kick and the ball smashed against the post. A corner was whipped in, Van Persie headed the ball, Jones headed the ball, it was offside and over the goal line. Stambouli picked up the first yellow of the game, Townsend then went into the book. 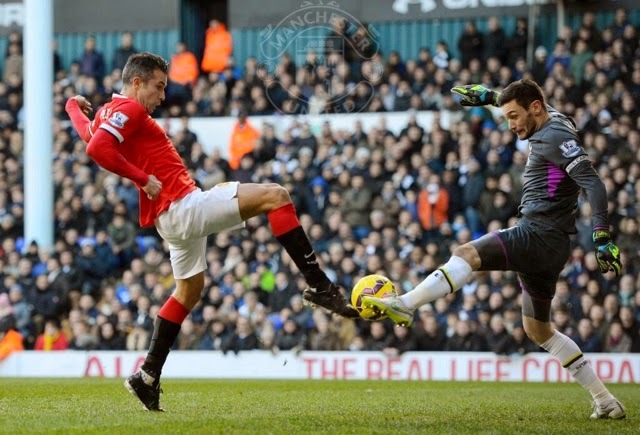 Spurs looked dangerous throughout but Van Persie and Falcao were main threats in the first half. The visitors kept coming but Mata's through ball to Falcao was wasted by the Colombian. Van Persie took a chance with a kick up session but he lost control and Lloris was fine with capturing the ball, he should've shot first time from Carricks ball in. United had a free kick and Pochetino wasn't happy when he frantically whaled at the referee. Rooney showed how strong United are, he made a light run into the box, pulled off a shot, Lloris saved. Young took a shot that was curling in, might've been hitting the post but Lloris saved anyway just before half time. United took a corner, Spurs cleared, Van Persie got the ball from the clearance by the Red Devils from Hotspurs counter. Young had the ball in the corner, Tottenham cleared and the whistle blew for half time. Half time in North East London and United had been knocking on the door but Spurs kept them out and even tried to score themselves. The second half got underway and Rafael went on for the injured Valencia. Mata took a corner, it was headed onto the roof of the net and another corner was given and it was caught by Lloris. Mata sent a ball across the face of goal and Van Persie stuck the ball over, should've scored. Van Persie was wasting chances and Falcao was waiting but no one found him in the box. Townsend took a shot that challenged De Gea, the United keeper took the ball into his grasp. Tottenham started to trouble United. United worked well and Mata put the ball into the top tier. Controversy took place when Townsend went down from a tackle by Young and the Free kick wasn't given. Luke Shaw came on for McNair. Eriksen took a free kick, into the wall, Eriksen took the ball, fouled Mata, but Spurs got the free kick again. Eriksen took it off n and ace Gea saved. Chadli came off for Lamela and Townsend made way for Moussa Dembele. Spurs had a chance, Harry Kane ran the pitch, passed to Mason, he skied the ball over the goal. Falcao picked up a yellow from a clip on the heels of Harry Kane. Rafael got a card because aeries em was trying to turn and the Barzilian swept Eriksen away. Rooney headed the free kick attempt away. The Man of the Match was decided between Lloris of Spurs and Mata of United, the award was given to Lloris for his efforts to save Tottenham in the first half. The game was over and both teams got a point and United are still unbeaten for 9 games in the Barclays Premier League. Hugo Lloris' defiant effort keeps Manchester United out in a goalless draw with Spurs.